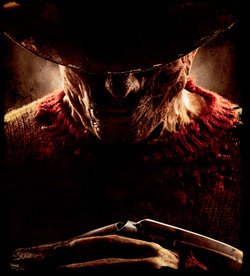 Screenwriter Wesley Strick wrote the initial draft for Platinum Dunes’ re-imagining of the horror classic A Nightmare on Elm Street. Feeling that the script still needed work, Platinum Dunes approached screenwriter Eric Heisserer to refine Strick’s draft. 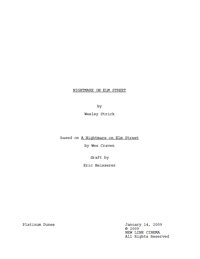 Available here is Heisserer’s draft from January 14, 2009, in PDF format. Kris steps out onto the balcony to find Dean standing precariously on the ledge. His breathing is shallow; panicked. Dean, what, what are you doing? Hello? Oh god are you asleep? Dean suddenly stops breathing and FOUR parallel slashes RIP through Dean’s shirt, as if by an invisible bladed weapon. — smashing through GLASS into a sun room where other teens are sleeping. His body shatters a glass-top coffee table, sending shards and blood in all directions as the other kids are awakened, spattered in Dean’s blood. THE CHILDREN’S SECTION. Little chairs and tables. Under one table, a SWARM of rats converge, and on that table rests one book. A children’s book. THE PIED PIPER. Quentin sees the title, and as Freddy’s gloved HAND reaches and grabs him — Quentin SNAPS AWAKE back in the reference section. Nancy stands before him, having gently grabbed him. The name stops Quentin cold. Beat. Nancy moves down the stairs into the slightly off-kilter boiler room: Like the real one except the colors are off, and the furnishings look like they did ten years ago. Spiders scurry past her feet. She backs up to the steps. From here she can see Quentin in the chair. A handful of spiders still crawl on his corpse. Nancy recoils, then steels herself. Poor Quentin. Must have been tired. Nancy cautiously steps toward Quentin. This is my nightmare. He’s not dead. Freddy is somewhere in the darkness of the boiler room, behind the pipes, around a corner… somewhere. Oh, were you relying on your boyfriend to wake you up? Nancy, in tears, finally accepting that Freddy got to him. I’m your boyfriend now, Nancy.